We've got just a few weeks left now before the Christine's Rankings champion of 2016 is crowned, so if you've spotted anything that needs to have some points assigned to it, do let me know in the usual ways! +5 Fernando Alonso: Once again, in Brazil, making the most of his time out of the running - picking up some new camera skills, or maybe not. +5 Lewis Hamilton: Being particularly thoughtful to his poor grid girl in Brazil, and giving her his coat. 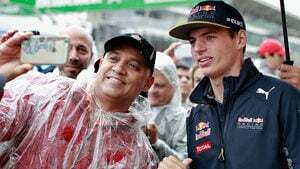 +2 Max Verstappen: Admitting that he doesn't always deserve driver of the day, but of course he did in Brazil. +1 Nico Rosberg: Sharing some lovely thoughts about and to Felipe Massa after his emotional home race. -1 Max Verstappen: Setting a bad example by not wearing a cycle helmet on his track ride. +4 Felipe Massa: So many points to Massa for coping with this emotional end to his final home race. Beautiful stuff. +1 Nico Hülkenberg: Showing his human side in that all that bad luck is starting to get to him! +1 Sergio Pérez: Standing up for what he believes in, even at the expense of a sponsor.